Yahoo Says Hackers Stole Information From More Than 1 Billion Accounts : The Two-Way The company says the intruders accessed names, email addresses, phone numbers, dates of birth and even security questions. This is the second major hack announced by Yahoo in less than three months. 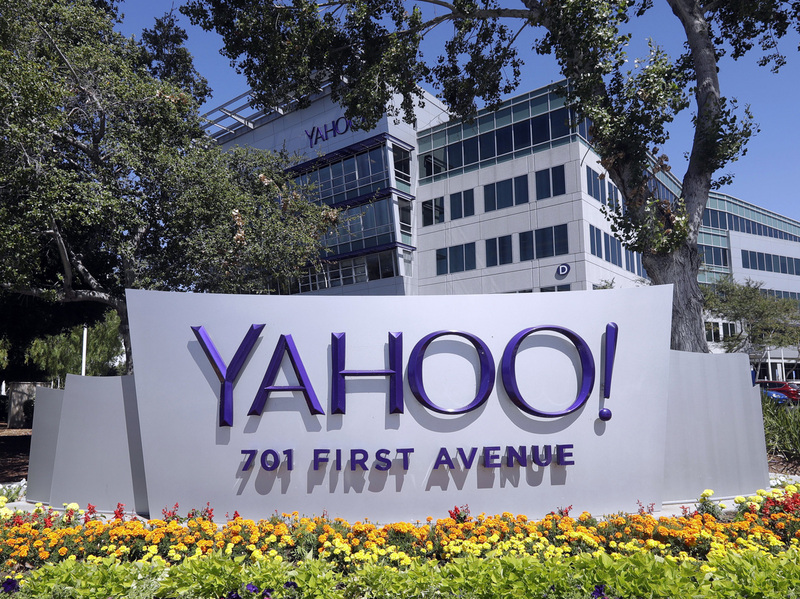 A Yahoo sign at the company's headquarters in Sunnyvale, Calif. The company has announced a hacking of user accounts that happened in 2013, but it says payment card information was not accessed. Yahoo says hackers stole names, email addresses, phone numbers, dates of birth and encrypted or unencrypted security questions and answers from more than 1 billion accounts. In a statement posted to its website on Wednesday, the company said it had "taken steps to secure user accounts and is working closely with law enforcement." "The investigation indicates that the stolen information did not include passwords in clear text, payment card data, or bank account information. Payment card data and bank account information are not stored in the system the company believes was affected." This is the second major breach of private user information Yahoo has announced in the past three months. In September, the company said information associated with at least 500 million user accounts had been stolen in 2014, as we reported. That security breach allowed hackers to steal the same types of information the company thinks were stolen in this instance. As it did in September, Yahoo created an FAQ page to answer questions from account holders. In both cases, Yahoo said its outside forensics experts had connected at least some elements of the hacking to a "state-sponsored actor" but did not say which foreign government it believed had supported the hack. Earlier this year, Verizon agreed to buy Yahoo for $4.8 billion. The purchase is supposed to be finalized early in 2017, but after the first hack was announced in September, Verizon said it would "evaluate" its potential impact on the deal. On Wednesday, Verizon said in a statement to The Associated Press that it would review the "new development before reaching any final conclusions."